Drawing on over 100 years of legal experience, the Chicago Family Lawyers at Hoffenberg & Block provide aggressive, effective representation focused on meeting each client’s unique needs. If you are facing legal challenges in the areas of family law, including divorce and legal separation, child custody and visitation, spousal maintenance, child support, property division, modification or enforcement of current court orders, prenuptial and postnuptial agreements, and civil unions, please contact us for a no-obligation case evaluation. I was referred to Alan Hoffenberg by a friend and after our initial consultation I was confident he would be the right choice to handle my divorce. He did not disappoint. He was sensitive to my needs, kept me on track with what needed to be done and helped me with all of the daunting paperwork every step of the way. His guidance throughout the process was very helpful and he handled the opposing counsel with the right amount of professional “toughness” that represented my best interests. The divorce was completed in a timely manner and I was pleased with the outcome. I would not hesitate to recommend Alan Hoffenberg for his professionalism, and vast knowledge and experience in marital law. Gloria Block and Russell Reid have been true life savers for me…. My case was mentally and emotionally draining. I watched a system that is not designed for fathers control the life of my son. I was even more devastated in the way his biological mother handled raising/caring for our son and my place in his life. I had never been any way but respectful and supportive of her since the day our son was born. We went through a Child Rep who took almost (7) seven years to do what he knew he should have done from day 1, while my son suffered mentally and emotionally silently for years. That alone could have destroyed my child. We then went to a Guardian Ad Litem, through Mediation, a Child Therapist, back to Mediation, an Arbitrator, a Judge Mediator and then back to the case judge. 7 Years later, my son is home with me and my wife (who has been an awesome mother figure to him since he was 2 years old and whom he loves dearly). and he is doing very well. This case unfortunately cost him his relationship with his biological mother and has destroyed his faith in the legal system and those that are trained and paid very well to protect the child. I must add that I am working with him through the issues surrounding his mother because no matter how horrible she was to him and to me, nor how she used the legal system to hurt us all for years, it is still important to me for him to have a loving relationship with his biological mother. I give all of the Glory to God and the team of lawyers he blessed me with. Gloria Block and her Assistant Russell Reid have been true life savers for me, my family and especially our son. Attorney Block helped bring clear direction and purpose to our case. She immediately halted all negative personal/legal action by my son’s mother and her Attorney that clearly were directed at prolonging the case while bringing more chaos and negativity into play, which ultimately only harmed our son. She personally held everyone accountable from the first day that she agreed to represent us (4) four years into this case. We had our ups and downs through the legal system, but she kept fighting for my son’s well being and ultimately directed the fight that gave my son the peace that every child deserves. I now have legal residential custody of my son and I oversee all day to day activities and care. He is now at peace, truly thriving and doing very well. To not bring direct light to my son and what he has endured, I have to settle on giving a big public “shout out” via the internet to Gloria Block and Russell Reid for being more than our attorneys, but for being a part of our extended family and caring enough to dedicate your legal knowledge for the well being and care of a child who did not deserve what he had endured, but one who now has the direction he needs in life to thrive, uncontrolled and uninhibited while being surrounded in true love, a family that is dedicated to him and being totally blessed with complete support. “I would like to thank both Alan Hoffenberg and Tiffany Alexander for standing by me all those months while I was going through a miserable divorce, which was the most difficult time of my life. For 20 years of my marriage, my husband had controlled all aspects of my life and all the finances. All my life I had just been a mom and a homemaker. I lacked confidence and couldn’t speak up to defend myself or to stand up for myself having very limited contact with the other people. Although I finally decided to file for divorce, it wasn’t easy by any means. I was scared of my husband and what he was capable of doing. He also had a lot of contacts and legal advisers while I had none. 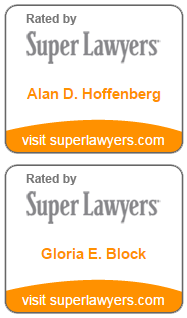 I was desperate and searching online for a divorce attorney when I came across the name Hoffenberg & Block. I called them on a hunch and got through to Alan. The first time I spoke to him, he actually listened to me. I felt he was someone who understood my anxieties and problems I was facing. He kept telling me not to worry until he tells me to, which was his way of letting me know they would take care of all my worries for me. Alan Hoffenberg was my divorce attorney, representing me in the dissolution of a 30 year marriage. He was not only my attorney; he was also my counselor, helping me through a very difficult time in my life. He was a good friend when I needed it, but more importantly he was strong when I wasn’t and protective when I needed him. No one wants to have a divorce attorney, but I always knew that Alan was diligently working on my behalf and always had my best interests at heart. Three years after my divorce, when my former spouse decided to take me back to court, my case went to trial. It was then that Alan showed me a different side of him, a powerful force in the courtroom that I was glad to have on my side. He proved to the judge that my ex-husband was undeserving of reducing the settlement and he fought to allow me to retain my dignity and preserve my financial independence. Thank you Alan. So thankful that you were there, by my side and I truly felt your concern for me…you have no idea how much that means to me. The divorce process can be emotionally frustrating and seemingly needlessly drawn out at times. Hoffenberg & Block has an appreciation for your needs and ability to create a working plan to follow in order to achieve the best possible outcome. I would highly recommend them! Gloria, I want to thank you and tell you how impressed I was with your performance today and how well things went in Court. I am not sure it could have gone any better. You are a phenomenal lawyer …. “Russ, I just wanted to reach out and tell you how happy and grateful I am for everything you have done for me and my family. You were very passionate and professional about my case and it showed. I truly look forward to having the responsibilities of being in charge of the decision making for the kids for their entire lives. You are a phenomenal lawyer and I consider you a great friend. Thank you again for all your hard work and long hours you put in to ensure the children are safe with me. I will be sure to personally recommend you to any family or friend that needs legal advice. Norma, I’d like to thank you as well for everything you have done for me throughout my court battle. You are a sweet woman and I consider you a friend as well. I just wanted to thank everyone at Hoffenberg & Block for all your help in my Child Support case. It was nice finally finding a law firm that seemed to actually care about my case. I appreciated your hard work and quick responses to all my questions via by e-mail or phone. I liked that you gave me a realistic expectation for the outcome of my case before going to court, so that there were no surprises. Also, I was very impressed on how quickly you were able to close my case with a favorable outcome. I had tried a couple of other lawyers in the past with big reputations and so-called “years of experience” in Family Law, but was very unhappy with their performance. They made unrealistic promises for my case just to gain me as a client. Frankly, I ended up with a huge bill with nothing to show for it. It seemed like they kept stalling time just to get more money out of me. You on the other hand never seemed to waste any time, which saved me some money in the long run. P.S. I keep recommending you to all my friends! Thank you very much for your very efficient representation in regards to my recent family law matter. I am very grateful I have had such a professional, diligent and dedicated legal team on my side. Your level of professionalism shines through…. “Gloria, I want to once again thank you for all your hard work and support over the past few months. It really means a lot to me, to have someone right the wrongs, and undo the injustices brought on my kids and I. Your level of professionalism shines through. I know I am in good hands, and you are making a positive impact on my life. I’m writing to express my gratitude for your associate, Jonathan Beremen. I am very pleased with the services he provided to me during my divorce. Jon took over my case at its early stages and deftly handled a difficult opposing party and attorney. I am very happy with the quick and favorable settlement he negotiated. Moreover, in his interactions with me, he was always knowledgeable, professional, and responsive. At a difficult time in my life, I appreciated having an advocate like him on my side. Jon’s legal and professional skills, and will be sure to recommend him and your firm whenever I can.